The next and possibly most important step is making sure you can eat off of your man cave floor and that you'll be warm enough in the winter and cool enough in the summer to want to. Let's first make your man cave energy efficient by by installing insulation and drywall. There are many different types of insulation to choose from including batt (a fairly inexpensive, easy-to-install cotton-fiberglass material) and blown-in insulation (a bit more expensive and installed after the drywall is in place). Drywall is drywall, but before installing make sure that you have plenty of electrical connections in place as well as any water piping you might need so you're not cutting holes in your newly surfaced man cave walls. Here are some links on how to properly install both insulation and drywall if you don't have an infinite amount of simple housing construction knowledge. 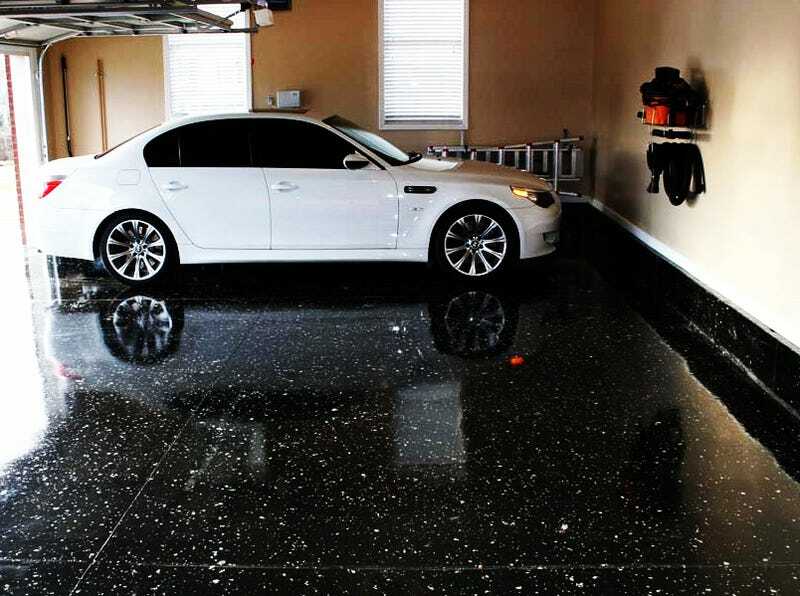 There are many solutions on the market for garage floor coverings ranging from simple interlocking tiling to a nice U Coat It water-based epoxy covering. Either direction you choose, make sure that it will provide an easy clean up surface for when you blow a gasket on your vintage racing Porsche 356 after a fun and slightly abusive day at the track. Our personal choice for man cave floor covering would be the U Coat It epoxy as it has a relatively low cost (Under $500 for a 2 1/2 car garage), oil and chemical clean up is as simple as a simple wipe up or spray down, and reflective flooring just looks bad as hell. But if you're looking for a covering that's easier to remove and quicker to install then you may want to consider Daytona Garage Interlocking Floor Tiles from GarageFloor.com. For under $100 you'll get 40 one-square-foot tiles, so depending on the size of your man cave space, you'll end up spending less than an epoxy coating meaning you have more greenbacks for tools and toys. A central drain wouldn't hurt either for when you've got a large spill or you're just the kind of guy to wash his car in his garage.